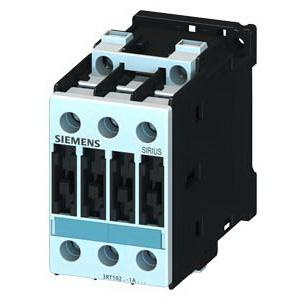 Siemens Sirius 3-Pole 3RT Series IEC Contactor has coil voltage rating of 24-Volt AC at 50/60-Hz and current rating of 35/25-Amps. It has screw terminal connection and supports screw/snap-on mounting. Contactor has power rating of 2 hp at 115-Volts, 3 hp at 230-Volts, 7-1/2 hp at 200-Volts, 7-1/2 hp at 230-Volts, 15 hp at 460-Volts, 20 hp at 575-Volts and 11-Kilo-Watts at 400-Volts. NEMA S0 rated contactor accepts two 16 - 12-AWG, two 14 - 10-AWG, one 8-AWG main, two 20 - 16-AWG, two 18 - 14-AWG, one 12-AWG size auxiliary wires for optimal conductivity. It offers IP20-degree of protection from harsh environments. Contactor withstands temperature rating of -25 to 50 deg C. Contactor is UL listed, CSA/CE/CCC certified and meets EAC standards.